Read more pieces like this in our quarterly print issues. Stacy Hamilton needs shelter. Lately she’s been sleeping in the Walmart parking lot with her boyfriend Dave. But Dave’s been missing since the morning. It’s Friday afternoon, and if she can’t find him she’ll sleep in the woods. She lives by the day; every day is a struggle to survive. She’s not from around here. Addiction, the death of her mother, and a nervous breakdown sent her into a downward spiral. She lost her husband and her kids, ended up in poverty and came to the Salvation Army shelter in Hickory, North Carolina to escape an abusive ex in Winston-Salem. The Salvation Army was the end of the line; where you live after the fall. It’s where she met Dave. But after 90 days at the homeless shelter you have to wait six months before you can return, and 90 days ain’t enough to get back on your feet. So Stacy and Dave ended up in a plastic tent in a hollow behind the Golden Corral, not far from the Hilton Garden Inn where Stacy found a housekeeping job for minimum wage. When Dave got a car, the back of the Walmart parking lot became a luxury. Once the “furniture capital of the world,” Hickory was left behind by the 21st century. The city of 40,000 dominated the industrial economy of North Carolina’s western Piedmont. Now the Wendy’s and Dollar General stores, abandoned properties and empty factories are the main signs of an economy, an ugly contrast against the views of Appalachia in the distance. Hickory and the rural areas around it are overwhelmed by underemployment, heroin, meth, pills, despair, and homelessness. In Hickory the epicenter is Lenoir Rhyne Boulevard, and that’s where I met Stacy, hanging out at the Life House, a day shelter next to the Salvation Army. According to the North Carolina Coalition to End Homelessness, there were 8,962 homeless in the state in the early months of 2017, and nearly a third had no shelter. Tent cities are an open secret. They’re in Raleigh, and Durham, not far from the nicest neighborhoods of the richest country on earth. And they’re all over Hickory, in the woods behind chain restaurants, in places most people choose not to look. They’re technically illegal. But it’s better than sleeping in a public park, or on the steps of City Hall, and absent trouble they’re usually allowed to stay. On the hill behind the Bojangles and Burger King there are tents in my hometown too, about an hour north of Hickory. But Hickory is the worst. I first read about Hickory during my final year of law school, how this one man named Roger Cornett kept people alive out of his own Christian charity and catharsis. I visited Hickory four years later in late 2017, and Roger was still the only support system for hundreds of men and women sleeping in the woods. We drove around in his van and visited the camps. I learned the street names (Pops, Cherokee, Smurf) of men and women who lost jobs and survived on disability checks or ringing the Salvation Army bell outside Walmart around Christmas. Four issues each year for only $29. Stacy’s brown hair is tied in a ponytail and she’s wearing a thick coat over her work uniform as she waits at the Life House for Dave. She sees Roger Cornett a few tables over (in his customary orange t-shirt and khakis) and asks if he’ll find her a spot if Dave doesn’t return. “I’d be dead or gone if not for Roger,” Stacy says. Roger bought her a tent when she first left the shelter. Roger, wearing a bright orange shirt so people can see him approaching out in the woods, makes his rounds as something of a DIY social worker, greeting newcomers and fielding requests for jobs and supplies. He’s not a minister. He’s a retired guy with a van, and he spends each day driving around Hickory. Making furniture was replaced by jobs stocking shelves or manning the checkout counter. Hickory’s metro area made headlines for unemployment and was once ranked the fifth most miserable city in the United States. Hickory experienced the usual symptoms of desperation and poverty: broken families and drug addiction. But according to Roger, homelessness was the most dire issue because the area frowned on trailer parks and lacked affordable housing options. There were fewer jobs. New jobs paid less. Laid off factory workers had few benefits to retire on and North Carolina’s safety net was insufficient. The Salvation Army was overwhelmed (and still is), and with no other place to go the homeless gathered in tent cities in the groves of trees behind the corporations that replaced their livelihood, often camping on private property that big companies either don’t realize they own or choose to look the other way about. When Roger first heard about the tent camps he didn’t believe it. But he went out and found a couple curled up in sleeping bags covered with mud, with no tents, and that’s when he became a missionary on his own streets. Open Door ministry is his reason to get out of bed. 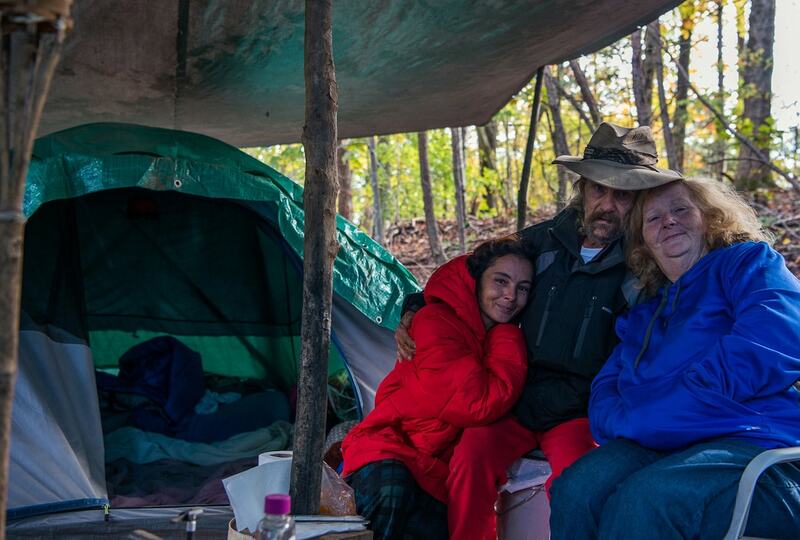 On a budget of $20,000 a year (mostly donations from local churches, and a friend who throws Hickory’s best parties and gives Roger a cut of the door) he buys tents and helps the United Way conduct an annual homeless count. He tracked 85 new faces in the area between last July and September, and estimates there are now 300 in the woods of Hickory, spread across several dozen camps. Roger doesn’t take a salary, and he lives off the disability check he receives for his illness. His dream is to build a shelter with enough space for everyone: a semi-circle built like a hotel with a chapel in the center, and addiction services on hand. He estimates 30 percent of the homeless suffer from mental illness, another 30 percent from addiction, and the remainder from a combination, or from their own despair as they mourn lost jobs and withdraw from society into the woods. On the farms of rural North Carolina there was stability and meaning, and in the factories you could build and create something. It’s harder to find a sense of purpose in selling Chinese goods in the Dollar General, and Roger’s greatest concern isn’t saving the homeless, it’s giving them reason to live. A day shadowing Roger is long: he wakes up at 5 a.m. and takes pain meds for the strength to get out of bed (it takes a couple hours) and then he’s out on the road. He keeps a bag of medical supplies and personal hygiene products in his office, and from the back of his van he gives out socks and heaters. We drive around Hickory well into the evening, visiting shelters and the camps. We’re still looking a place for Stacy to sleep. As the sun goes down we make our last stop off Tate Boulevard behind an old factory. We park on the gravel and walk-down a trail several hundred feet through the brush. Roger yells out “incoming” as we enter one of the nicest of Hickory’s camps. “It’s a mess right now, please excuse my home,” says Tina, raking leaves off the camp’s perimeter as if it was a floor. She’s missing teeth, and her brunette hair is tangled and unkempt. But she’s as friendly as you can be in that moment, defensive and personable all at once. She was a nurse in Tennessee for 21 years before a broken marriage and an addiction to meth. Roger found her sleeping on the grounds of a mental hospital one county over, and he got her into the Salvation Army shelter. That’s where she met Tom, a sturdy middle-aged ex-Navy Seal who is wearing camouflage pants, drinking coffee and smoking cigarettes when we enter the camp. When their 90 days at the Salvation Army ended, Tina and Tom stuck out together. Their last camp was broken up by the cops and they’ve been here for only three months, but it’s already a castle of tarp. Tree branches cut into poles hold up the kitchen, where condiments are stacked on a plastic table and rusted coffee tins rest on a Coleman propane stove. The shampoo, toothpaste and personal items are on a homemade shelf. There’s a latrine out back walled off by blankets: a wooden chair (the kind they used to make in Hickory) with a faded red cushion and a hole in the bottom carved and covered by a toilet seat. Candles. She relies on them to warm the tent. Tina asks for candles and twine for the tarp and Tom walks with Roger and me back up to the van. Tomorrow is Veteran’s Day and Roger asks if Tom plans to attend the dinner at the VFW. Tom is ashamed to admit he didn’t know it was Veteran’s Day. He doesn’t talk about his service (but I sense the pride from the Navy sweatshirt on the clothesline and the American flag stuck in a tree) and Roger tells me later he was discharged in 2006 after 13 years in the military, including time in combat. After debrief, he ended up in a hospital for PTSD, and back in Hickory he lost a job due to DWI arrests. “I’ve come a long way back, but not that far,” says Tom. He’s in a different world still. He pauses for a moment and then tells us how thankful he is for Tina. “Tina is a good woman,” he says and walks back into the woods. It’s dark. Scalawag relies on readers like you to lift up unheard voices and untold stories. Monét Noelle Marshall is an artist, director, curator and cultural organizer, and the founding Artistic Director of MOJOAA Performing Arts Company and Director of Programs at VAE Raleigh. Saba Taj is a visual artist and current Director of the Carrack Modern Art Gallery in Durham, North Carolina. Scalawag editor Zaina Alsous interviews Monét Noelle Marshall and Saba Taj on navigating the tensions of collective accountability and individual creation in the arts. All profit is wage theft. The closure of the city’s biggest no-barrier emergency shelter, Peachtree-Pine, raised deep concerns for Atlanta’s homeless about the availability of emergency services. Is the city’s response enough? As a community-funded nonprofit, Scalawag relies on supporters like you to lift up the rich, varied, complex voices of the South. And through the end of the year, donations up to $1,000 to Scalawag will be doubled. Join us in the work of transforming our region by telling all its stories.